Pick Analysis: In 2014 as a junior, Peat was voted second-team All-American by The A.P. He was an Outland Trophy semifinalist in 2014 and started the final 27 games of his career at Stanford. In 2013, he started all 14 games at left tackle, was All-Pac-12 second team and voted team's Most Outstanding Sophomore (Deswarte-Ellar Award). As a Freshman in 2012, he played in 13 games, missing one game with a hand injury. He averaged 20 snaps a game as part of a rotation at left tackle. He was rated a five-star prospect by Rivals at Corona del Sol (Ariz.) high school and a USA Today, Parade, SuperPrep and PrepStar All-American. He was named Frank Kush Offensive Lineman of the Year and also lettered in basketball. His father, Todd, played six seasons in the NFL (St. Louis/Phoenix Cardinals: 1987-89 and Los Angeles Raiders: 1990, 1992-93). His brother, Todd, played football at Nebraska. Published: April 30, 2015 at 09:40 p.m. The New Orleans Saints pick Stanford tackle Andrus Peat No. 13 in the 2015 NFL Draft. 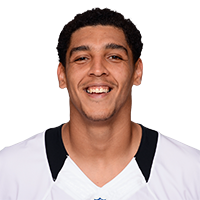 Published: April 30, 2015 at 11:49 p.m.
New Orleans offensive tackle Andrus Peat talks about what he will remember from today, his relief after being drafted and his days of playing basketball. Published: April 30, 2015 at 09:46 p.m.
New Orleans Saints tackle Andrus Peat shares his excitement about being drafted, and the pressure of having to protect Drew Brees. Published: April 8, 2015 at 10:34 p.m.
Take a look back at some of Stanford offensive lineman Andrus Peat's career highlights. Published: Feb. 26, 2015 at 06:05 p.m.
Colleen Wolfe and Bucky Brooks take a look at Stanford University offensive tackle Andrus Peat's 2015 NFL Draft stock after the combine. Published: Feb. 20, 2015 at 11:23 a.m.
Stanford offensive lineman Andrus Peat goes through the workouts at the 2015 NFL Scouting Combine. Former Stanford offensive tackle Andrus Peat descripes his style of play and compares himself to a few current offensive linemen.